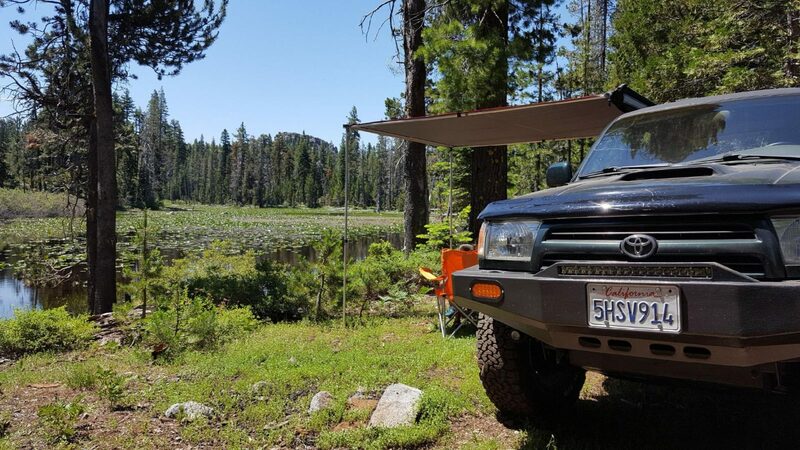 The Overland Pros Side Vehicle-Mounted Awning is constructed of 100% waterproof 280G ripstop canvas. 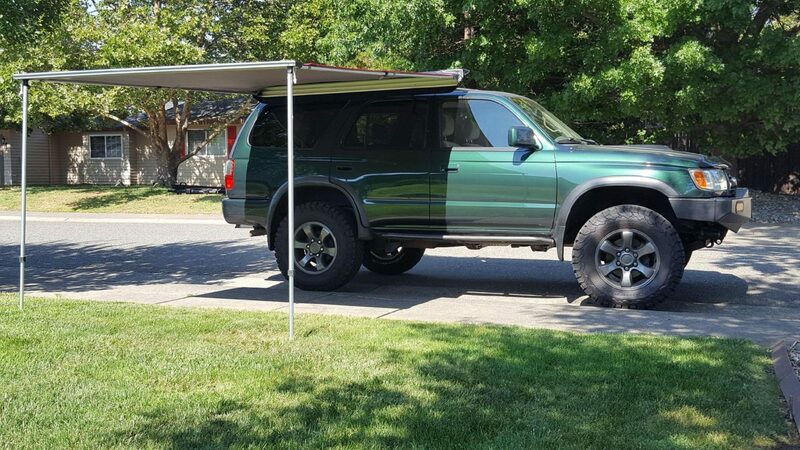 It quickly expands outward to provide shade next to your vehicle. It includes two height adjustable poles for varied ground. The awning can be quickly deployed by one person. Note- Adequate guying is required when using awning in windy conditions. 56" x 79", 79" x 99", 99" x 99"
In my research for a vehicle awning I came across many different models and brands. While many are very similar the Overland Pro models stuck out above the crowd. It started with communication. I had not heard of Overland Pros so I shot them an email and was pleased at the fast response. Nick answered all of my questions and knew the product very well. First off I was surprised at the packaging. The awning arrived in a cardboard box and inside the awning ends were protected by heavy awning cloth. Inside of the awning cover were tie down cord, stakes and mounting hardware. Mounting hardware consisted of aluminum L brackets, nuts and bolts as well as a ratcheting 10mm wrench. After unrolling the awning I noticed the seams were taped which I was not expecting. The taped seams further waterproof the awning just like a high end tent which is great. 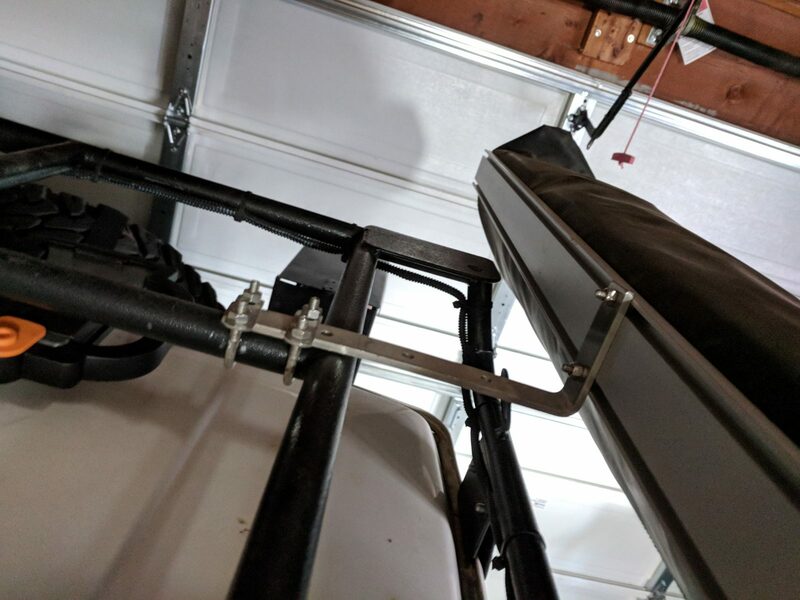 I was able to mount my awning to an after market roof rack very easily with the L brackets. 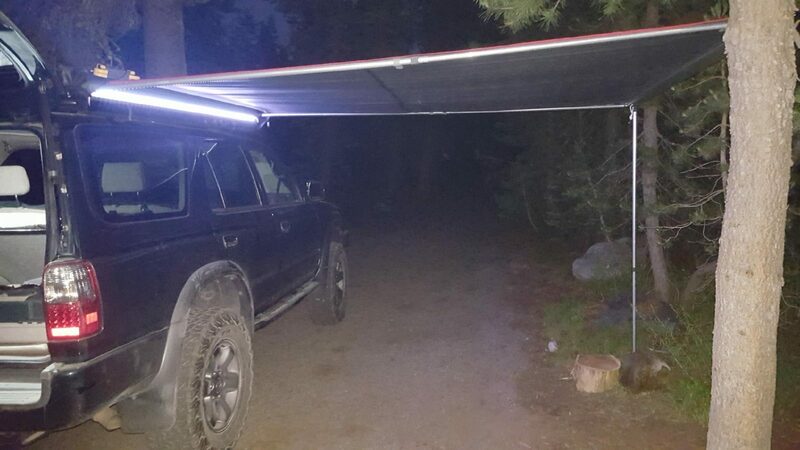 I imagine there are all kinds of ways to mount the awning and you may be able to be creative. Nut and bolt hardware is pretty straight forward and they have done a great job holding everything together on multiple trips. While the awning can be deployed by one person it is easiest with two. 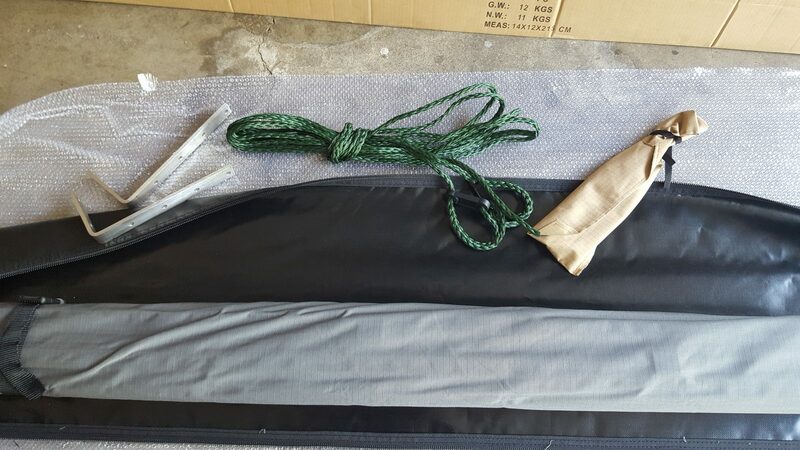 The legs are adjustable and the out rigger poles add tension to the awning cloth which keeps rain from pooling and the wind from flapping it around. I added an LED strip from Amazon like shown in the pictures as they are not included. All in all I am very pleased with my 2.5 meter awning and would buy another one in the future. The value and quality is above what you pay for. Great awning at a unbeatable price. 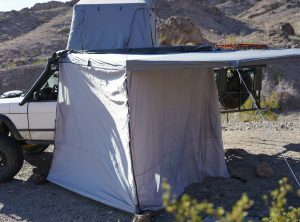 The Overland Pros Wraptor 2500 Vehicle-Mounted Awning is constructed of waterproof 280G ripstop canvas. It quickly expands to give you 270 degrees of shade around your vehicle. 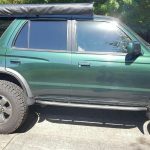 It includes all 4 structural poles that pivot around your vehicle and connect to 4 height adjustable poles for stability. The rigid structural poles between the panels keep the awning taut, not seen with some competitors. The awning can be deployed by one person in just a few minutes. Available walls can be attached between the poles to provide shade or a full set of walls forms a full enclosure. The optional walls are made from lightweight waterproof 200D polyester and are available to purchase separately. The Wraptor 2500 measures 2.5 meters (98 inches or 8.2 feet) long when stowed on the vehicle. 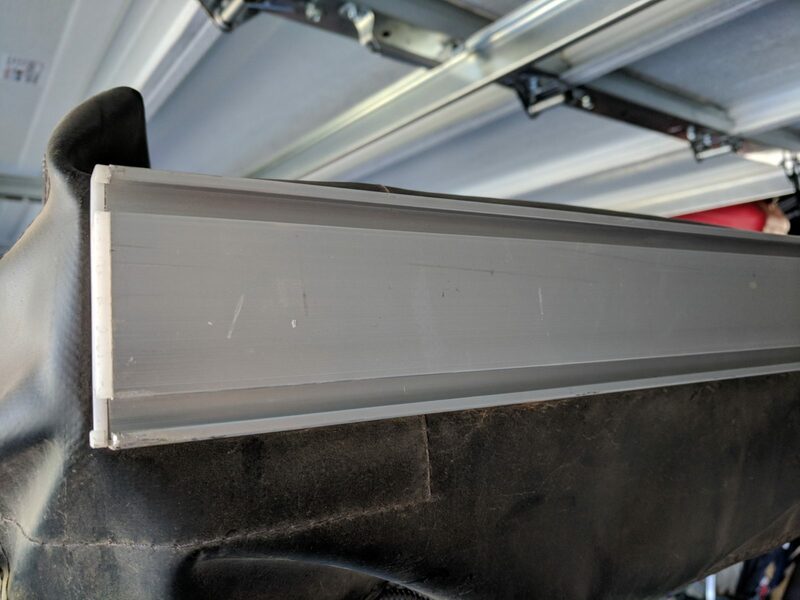 The awning will need to be mounted with the rear extending beyond the back of the vehicle to allow the awning to swing to 90 degrees for full 270 degree coverage. 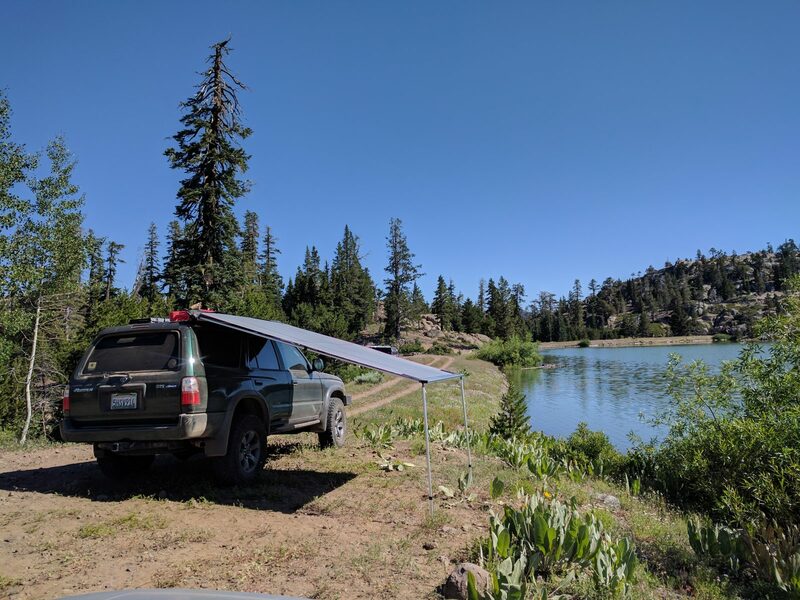 With out current version 2 design you can use the back strap to deploy the awning faster and skip the outer structural poles. They are of course still included if you wish to use them. The version 2 design also incorporates a cover flap over the zipper to keep moisture out better as well as 3 outer buckles to keep it tight on bumpy terrain. Passenger and driver side awnings now available! Recommended for full-size 4-door SUVs and trucks. The smaller Wraptor 2000 is better suited for 2-door vehicles or small SUvs. NOTE- The Wraptor 2500 is long and is classified as UPS oversize 2. Therefore, shipping is more expensive than a Wraptor 2000 which is not considered oversize. 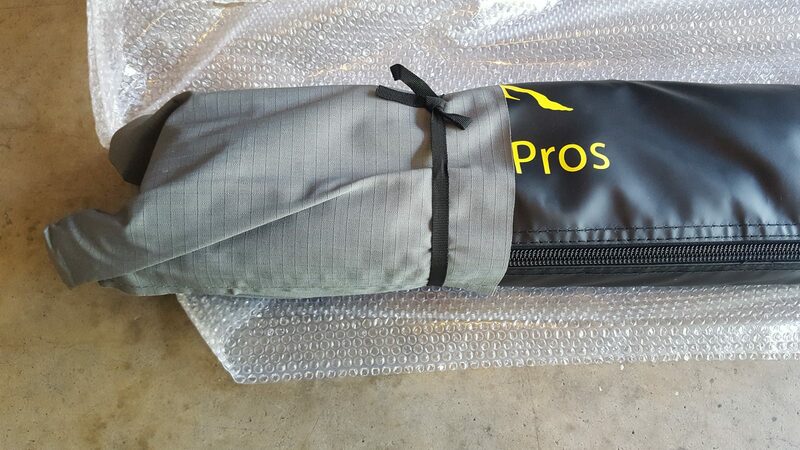 NOTE- Shipping a Wraptor 2500 with a RTT order will add $85 to the shipping cost due to the length of the box. 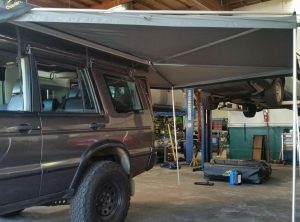 The Overland Pros Wraptor 2000 vehicle mounted Awning is constructed of waterproof 280G ripstop canvas. 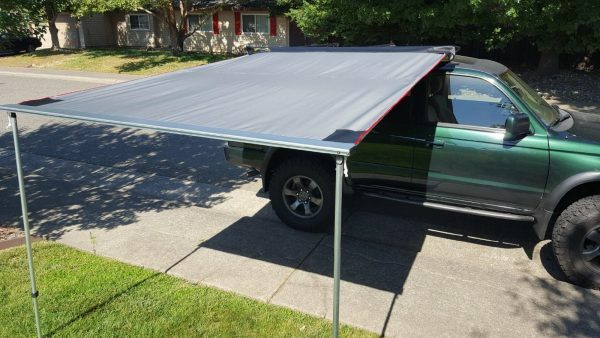 It quickly expands to give you 270 degrees of shade around your vehicle. 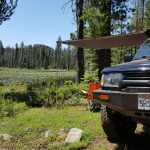 Included are 4 structural poles that pivot around your vehicle and connect to height adjustable poles for varied ground. The structural poles between the panels keep the awning taut which some competitor awnings do not provide. The awning structure when deployed does not require guy out lines for initial set-up but definitely required in windy conditions. The awning can be deployed by one person in just a few minutes. The Wraptor 2000 measures 2 meters (79 inches or 6.5 feet) long when stowed on the vehicle. 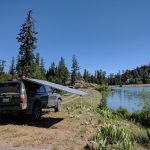 The awning will need to be mounted with the rear extending beyond the back of the vehicle to allow the awning to swing to 90 degrees for full 270 degree coverage. 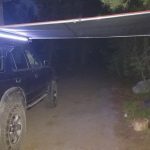 With out current version 2 design you can use the back strap to deploy the awning faster and skip the outer structural poles. They are of course still included if you wish to use them. The version 2 design also incorporates a cover flap over the zipper to keep moisture out better as well as 3 outer buckles to keep it tight on bumpy terrain. Available individual walls can be attached between the poles to provide a full enclosure or more shade or shelter from the wind. The optional walls are made from lightweight waterproof 200D polyester and are available to purchase separately. Available full Wraptor 2000 wall set is available providing 6 walls to turn the awning into a full enclosure. 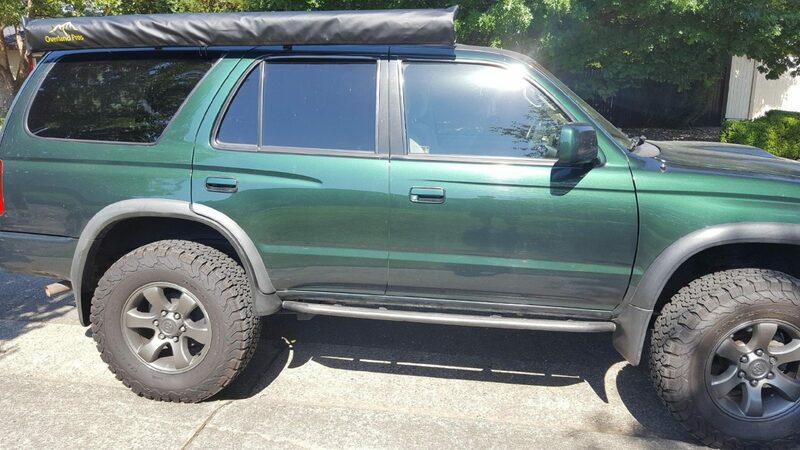 Recommended for 2-door vehicles or smaller SUVs. Be sure to specify drivers vs passenger side mount. 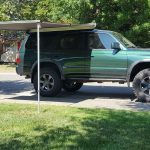 NOTE- if you purchase a Overland Pros roof top tent and and awning at the same time, the awning ships for free. This is a complete wall set for the Wraptor 2500. It includes all 6 sides- the 4 outer sides plus the 2 walls that run along the side and back of the vehicle. The walls can be attached between the support poles of the Wraptor to provide a complete enclosure around two sides of your vehicle. Each outer panel has a separate door and mosquito mesh to allow for cooling and entry. The panels attach to the top of the awning with a large velcro strip, attach to the poles with clips and to the the side of another panel with zippers. You can attach all panels to provide a complete enclosure or just a couple to provide additional shade. The panels are made from the same waterproof 200D polyester as the rain fly on our roof top and ground tents. We chose the lighter material over the 280G awning material to save on weight and make packing the panels more compact. The panels fully enclose the awning. This is a complete wall set for the Wraptor 2000. It includes all 6 sides- the 4 outer sides plus the 2 walls that run along the side and back of the vehicle. The walls can be attached between the support poles of the Wraptor to provide a complete enclosure around two sides of your vehicle. Each outer panel has a separate door and mosquito mesh to allow for cooling and entry. 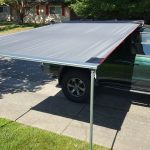 The panels attach to the top of the awning with a large velcro strip, attach to the poles with clips and to the the side of another panel with zippers. You can attach all panels to provide a complete enclosure or just a couple to provide additional shade. The panels are made from the same waterproof 200D polyester as the rain fly on our roof top and ground tents. 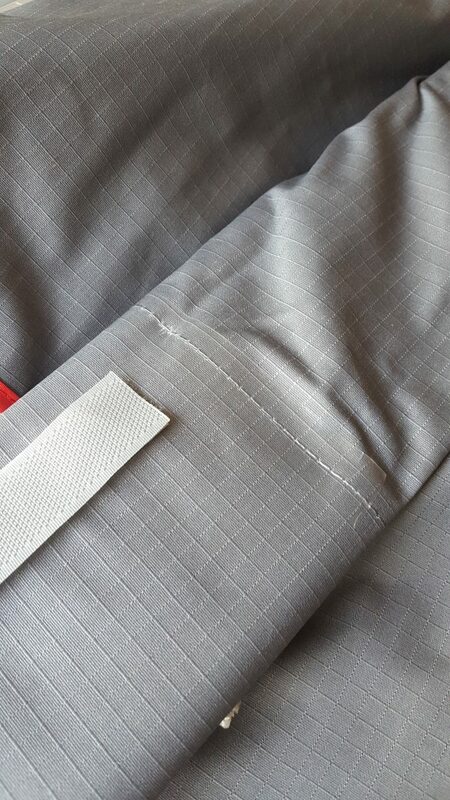 We chose the lighter material over the 280G awning material to save on weight and make packing the panels more compact. The panels fully enclose the awning. 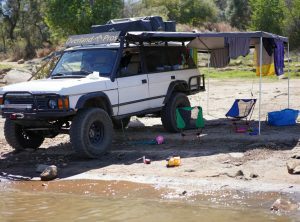 Side walls can be attached between the support poles of the Wraptor 2500 to provide a complete enclosure around two sides of your vehicle. You can also use them to create a privacy room (pictured) for a shower, toilet, etc. if you have one of our newer Wraptor awnings (see photo).The panels attach to the top of the awning with a large velcro strip, attach to the poles with clips and to the the side of another panel with zippers. You can attach all panels to provide a complete enclosure or just a couple to provide additional shade. The panels are made from the same waterproof 200D polyester as the rain fly on our roof top and ground tents. We chose the lighter material over the 280G awning material to save on weight and make packing the panels more compact. The panels fully enclose the awning (there are panels that run along the side and back of the vehicle as well). This is a single wall. If you want the complete set of walls, please see the Wraptor 2500 Wall Set.